Learn more about careers in this exciting and rewarding field. California grain and feed companies are always looking for talented and committed graduates from many different majors. You don’t have to be a farmer or a rancher. Great careers are available from many disciplines including: engineering, operations, sales, marketing, food science, nutrition, business, economics, research, environmental protection and more. The California grain and feed industry is like the Silicon Valley of agriculture. Because feeding the world with fewer resources takes innovation, businesses in this industry are using technology in ways you can only imagine. Jobs pay well and there are opportunities for advancement. So, consider becoming part of a movement to produce food safely, humanely and sustainably. CGFA represents the grain and feed industry in Sacramento. CGFA has two registered lobbyists on staff and a technical director who play a key role in influencing decision-making in California on behalf of the industry. 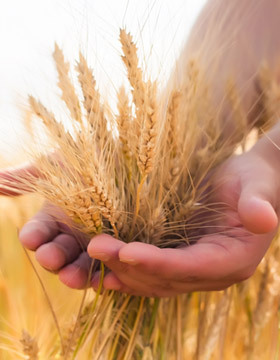 CGFA is involved in many issues including: agricultural marketing, transportation/trucking, air pollution laws and other environmental regulation, pesticide laws and registration, grain inspection, farm animal welfare, and more. For more information on the California State Senate, California Assembly, Committees, and more, click here. CGFA disseminates up-to-date information on all activities relating to the grain and feed industry via a periodic fax newsletter "Conveyor Currents", a quarterly newsletter "The Conveyor", special mailings, and more. CGFA also publishes the Pacific Southwest Directory, a complete listing of those firms involved in the Southwest. CGFA publishes manuals on feed and ag supply liens, SB198 Injury and Illness Prevention and more. To read more on our latest news and press releases, click here. CGFA provides opportunities for industry representatives to meet for social, business and educational purposes including the CGFA Annual Convention, Grain & Feed Industry Conference, California Animal Nutrition Conference, Key Management Conference, District Meetings, regular Environmental and Safety seminars, and various other Association-sponsored functions and seminars. For more information on our current and past events, click here. CGFA offers to all members money saving insurance programs including: Worker's Compensation, Health and Major Medical, Dental, Disability and Accidental Life Insurance, and Property and Casualty including product and general liability. CGFA also offers the daily Market Review News, and long distance telephone services at discount prices. Arbitration services are also available. To learn more about Membership Services, click here. CGFA Committees and Study Groups provide a problem solving mechanism in the areas of feed manufacturing, transportation, environmental regulation and safety, grain handling, hay, farm, dairy feed marketing and more. To learn more about the available CGFA Committees and Study Groups, click here. All members have access to CGFA's Environmental and Safety consulting staff. CGFA's staff has the technical expertise to answer most routine questions about compliance with environmental and safety laws pertinent to the grain and feed industry. Valuable information is just a phone call away. CGFA operates a Stormwater Monitoring Group participation in which is available to all members. For a comprehensive list of available environmental and safety services, click here.